Notes: I used approximately 40 grams of size 6 silver lined aqua round Japanese seed beads from Fusion Beads. Knitting this was not a picnic. There are several unconventional stitches used like k4tog and a three-into-seven increase or a five-into-one decrease. Then the beading! After the random bead placement in the garter section there is the charted bead placement in the edging. It is practically a bead every other stitch for the last few pattern rows. It took me days and I can't say I really enjoyed it. But the end result is quite beautiful. I'm on the final row of Celaeno. These last few rows have taken days to knit. 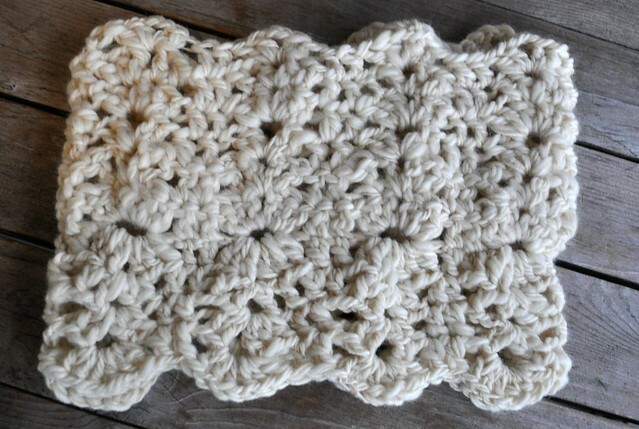 There is a bead placed nearly every other stitch so it's *purl one, pick up crochet hook, pick up bead, place bead on stitch, replace stitch on needle, knit stitch, repeat from *200 times. 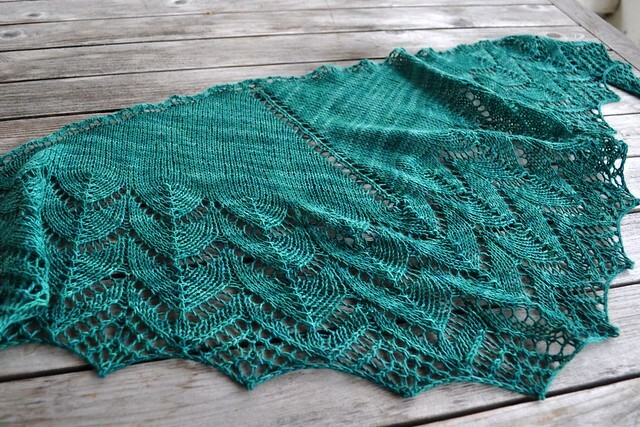 I had better love this shawl more than I have ever loved any other shawl when I'm done. Notes: Knit the smallest size with no changes. 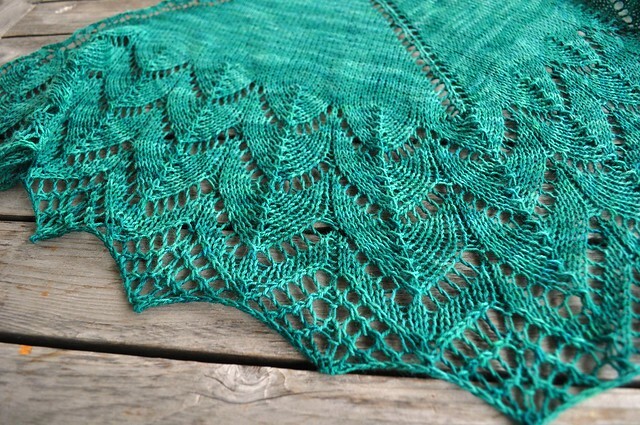 This is a very quick, easy to follow lace. Notes: I made the smallest size and it is quite petite although it blocked out nicely. I finally made an Ishbel. 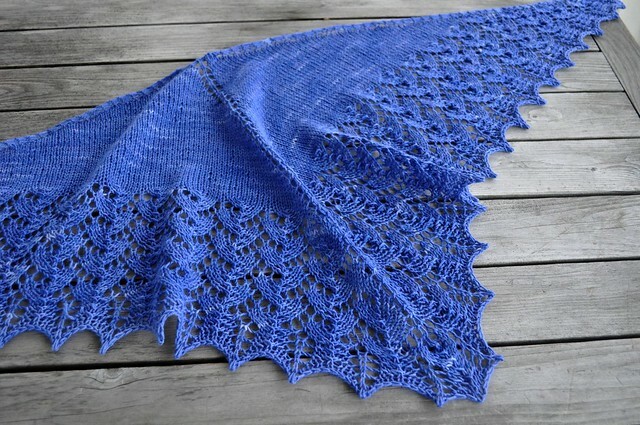 I used some skeins of Lorna's Laces Shepherd Sock in China Blue that has been in my stash for at least five years. 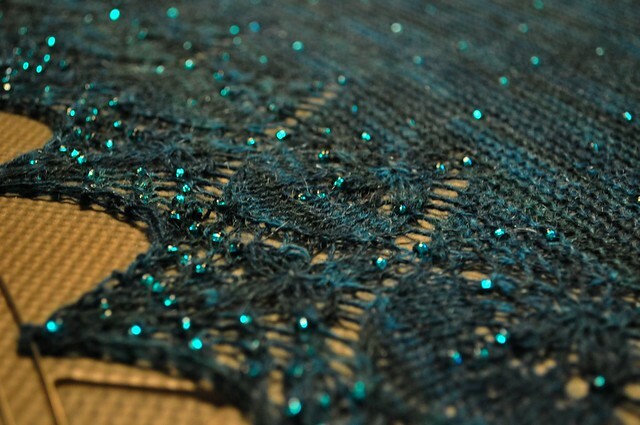 As you can see it has yet to undergo the magic of blocking. 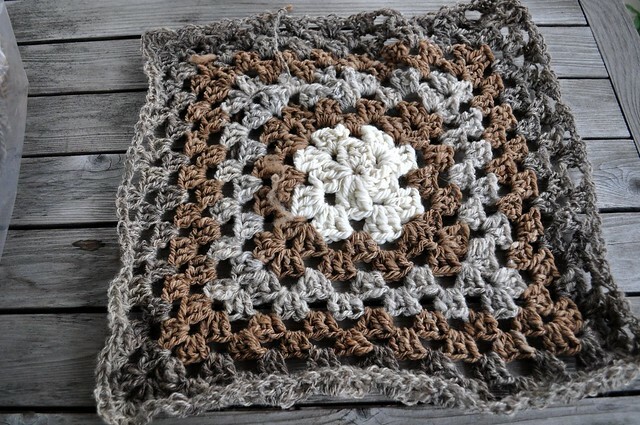 Then I was seized by a need to crochet a giant granny square like these Ravelers and others. And I had one of those moments when I realized that I had yarn that would be good for it that I've been wanting to use for years. These are all the sample skeins from my first spinning class that I took five years ago! I'm planning on adding this Romney-Coopworth-Angora from Off from a few years ago too. The square is now about two and a half feet across after starting it late on Friday night. It goes so quickly! I only have enough yarn to make it maybe three feet across. Eventually I'll need to spin more yarn for it. And I still have lots of oddballs left from my class samples. I was only able to use up all of a few skeins. I have no facility for understanding how much yarn each successive round takes. And they take a lot of yarn. Plus the yarn samples are all wildly different. This is lots of fun though. ...I plan to be happily out of fashion. And if you need me I'll be at my waxer. I can't stop knitting cowls! They are so fast, so satisfying, so excellent for using up random stash skeins. I finished another one over the weekend. I didn't take a picture yet but I thought you are probably all pretty sick of the endless cowl parade by now. 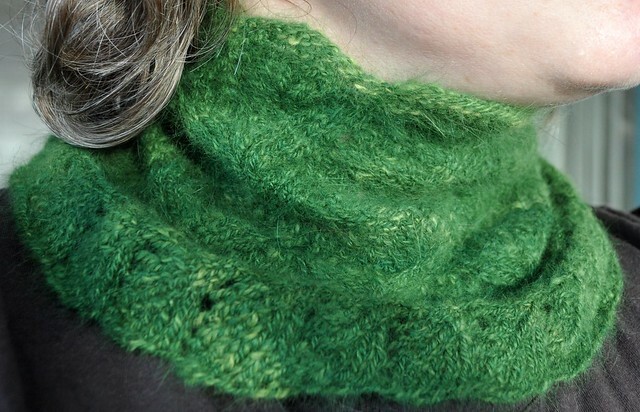 But if you have little time and/or money and need to knit a gift, make a cowl! 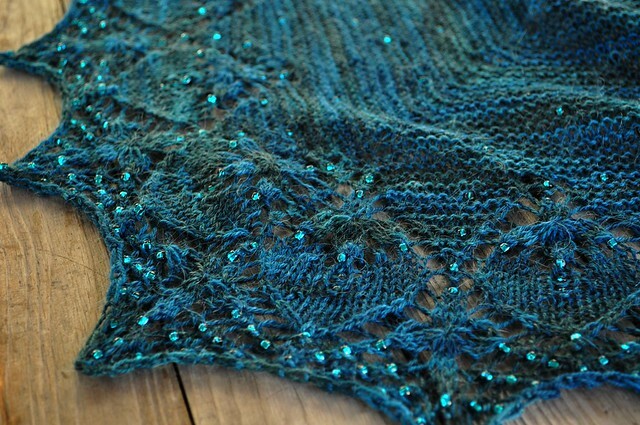 In other knitting news I'm still working on Celaeno. I have about 10 rows left but they are heavily beaded. I'm so sick of the beads. While I was at my retreat I started a Faberge Cowl with some ancient stash yarn. I couldn't find the 5/0 beads the pattern called for and thought I could get by with 6/0. After knitting half a round and practically shredding my yarn with every bead placement I pulled it off the needles and tore it out. A few nights ago I ended up on the Earth Faire site and bought a kit for this necklace by Sivia Harding (Sivia was wearing one when she visited the Seattle Knitters Guild earlier this year and we all loved it) and threw some 5/0 beads in my cart too. I may need to take a long break from beads after this. 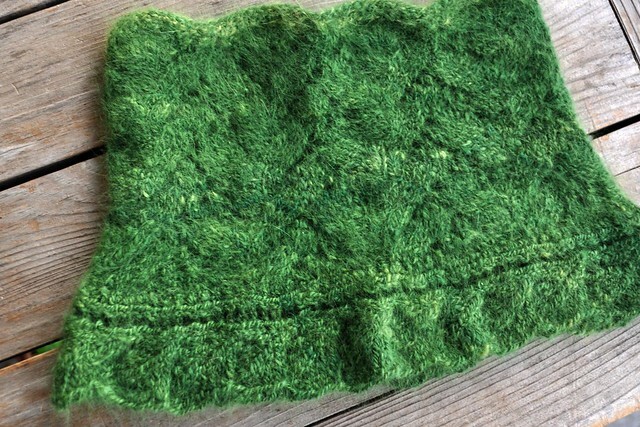 Also frogged, my green garter yoke sweater. It was ill-conceived and wasn't working. I was in denial. I'm going to start again soon. This week I also cast on an Ishbel. 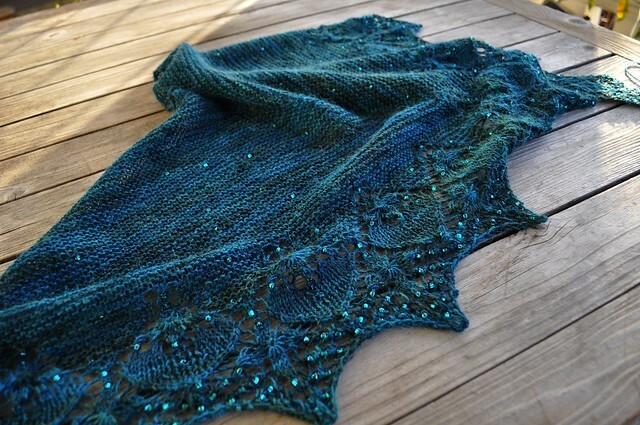 Check out how many Ishbels have been knit by Ravelers! 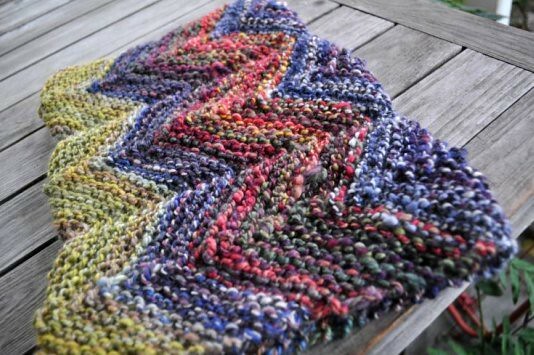 And did you see that Ravelry has reached 1,000,000 members? It's so amazing. Once again Twist has knocked it out of the park. So many great designs. They had me cooing at my computer screen. 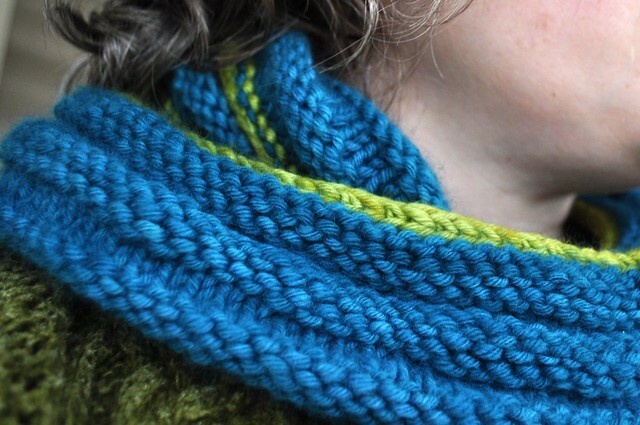 Notes: I thought I had about 110 yards of bulky handspun Finn but when I was halfway through the cowl I realized that I had included a skein of some other type of wool that I had spun much finer. So I only had enough yarn to work round 1-7, then 1-3 on the first side then 1-3 on the other side. Or something like that. I can’t imagine making it any longer anyway or it would cover my whole face. Also I crochet very tightly I guess. I should go up a few hook sizes next time. I'm thinking I should dye the cowl or it will get really grubby looking really fast. This took under two hours to complete. 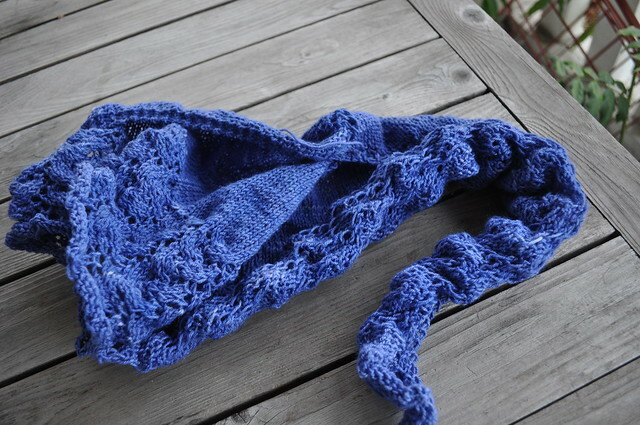 Notes: I cast on 90 stitches and knit ribbing for four rounds. Then I used the leaf chart (which is really more of a horseshoe and is shown upside down in my photo) from Evelyn Clark's Knitting Lace Triangles. I knit until I thought I would have just enough yarn to do four final rounds of ribbing and the bind off. I guessed wrong and had to rip back a bit more so I only did 2.5 repeats of the chart. 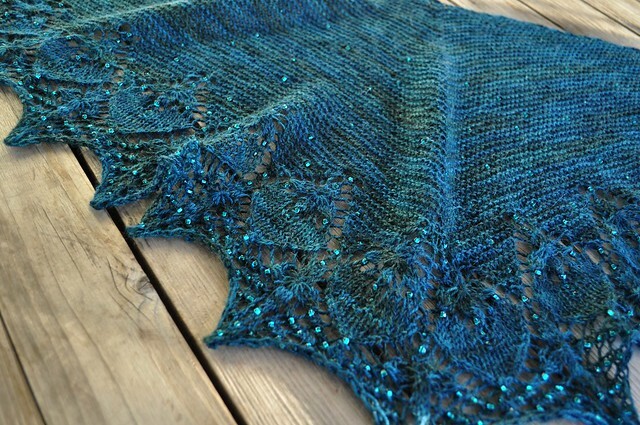 I knit this in a day. Very satisfying. Notes: I knit this pattern exactly as written. The pattern is beautifully designed and extremely well-written. The Twist is soft and so warm. I probably should have knit a size smaller because I think the yarn will grow a bit over time. 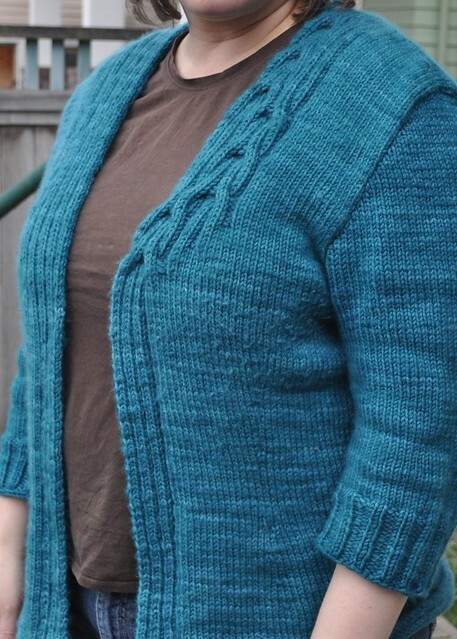 I love the finished sweater and have been wearing it constantly since finishing it. Notes: I cast on 180 stitches using the Moebius cast on from Cat's Bordhi's book. I knit ridges of 3 rounds of knit with 3 rounds of purl. I attempted to do an i-cord bind off but the i-cord looked really sloppy on the US10. I knit a round in the green on the 10s then switched to the 8s for the i-cord. 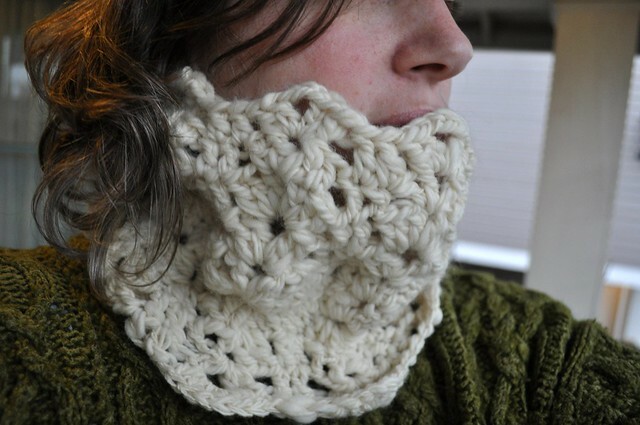 The cowl is long enough to wrap twice around my neck and fit snuggly under my chin. It's super soft and really toasty warm to wear. 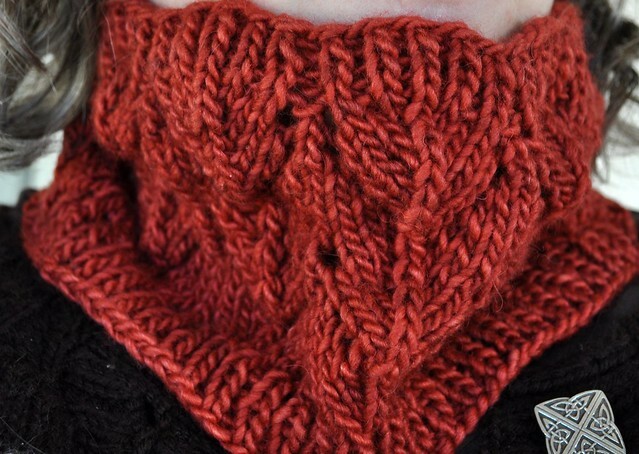 This method of cowl knitting is so intriguing. I highly recommend it! As the giant squid pulled her into the briny deep, she was never heard from again. Notes: My yarn is a bit thinner than the yarn called for so this came out a bit small. I should have used a larger needle because all the fluffiness really obscures the yarnovers. 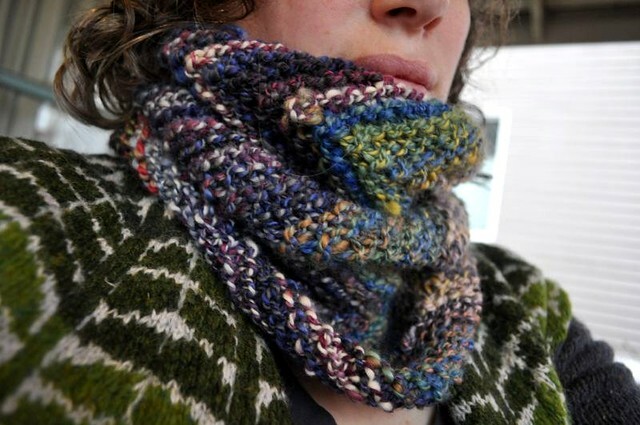 It's still a really stunning, soft and warm cowl. You know how they say, "If you can't say anything nice, don't say anything at all." Well...this definitely makes her waist look smaller. 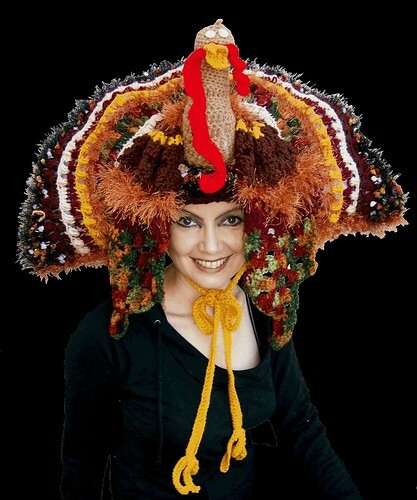 I'll be retreating to my annual fall knitting/spinning/chatting/laughing/eating extravaganza. See you next week! Notes: I know all the colors are insane and clash but I still kind of love them. Also since these were class samples the diameter and twist of the yarn changes quite a lot. 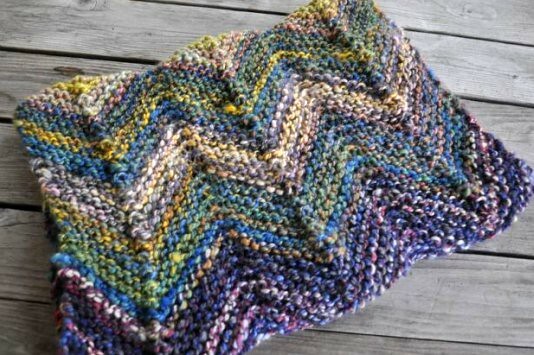 The pattern was a really simple, addictive knit and I think it mixes the colors well. I would highly recommend this for a last minute gift. I cast on at lunchtime on Saturday and finished Sunday evening.